If you're tired of the same old boring decor styles used on most patios, you should consider spicing things up a bit with an eclectic atmosphere. The fact is that most homeowners completely forget about this lesser-known style when decorating their patio; therefore, leaving out one of the most uniquely attractive methods of decorating. When it's done right, however, eclectic decor will bring new life and vibrancy to an otherwise boring patio. Unless you've used this style of decorating in the past, you may be a little confused as to what eclectic refers to. After all, it's not one of the most commonly used styles, so what exactly does it mean? In short, eclectic refers to a wide blend of styles and elements that's used to create something entirely unique in its own. Unlike other style of decorating that limit the colors, designs and shapes you can use,eclectic allows you to essentially create your own style. There's no denying the fact that eclectic decorating can be downright confusing to some. Without any strict rules or guidelines to follow, how are you supposed to know what elements to use? The bottom line is that you should try to create a unique appearance that's attractive and enjoyable to be around. If you're able to accomplish this, you've created the perfect eclectic atmosphere. The key principle to remember when creating an eclectic patio is to avoid a single theme or color. Don't be afraid to use a color scheme consisting of various bright colors, as it will bring more life and vibrancy to your patio. If you find yourself using a single color throughout the patio, try to use furnishings and elements in a different color to mix it up. When choosing the furniture for your patio, try to use bold, bright colors that stand out from the rest. Remember, eclectic decorating is all about using a mixture of elements that creates a uniquely attractive appearance, which is why bold colors usually seem to work. You can even go one step further by using a variety of colored furniture, such as green, red and blue lounge chairs. Just place them in the area of your patio that needs some type of furnishing to fill the voided space. 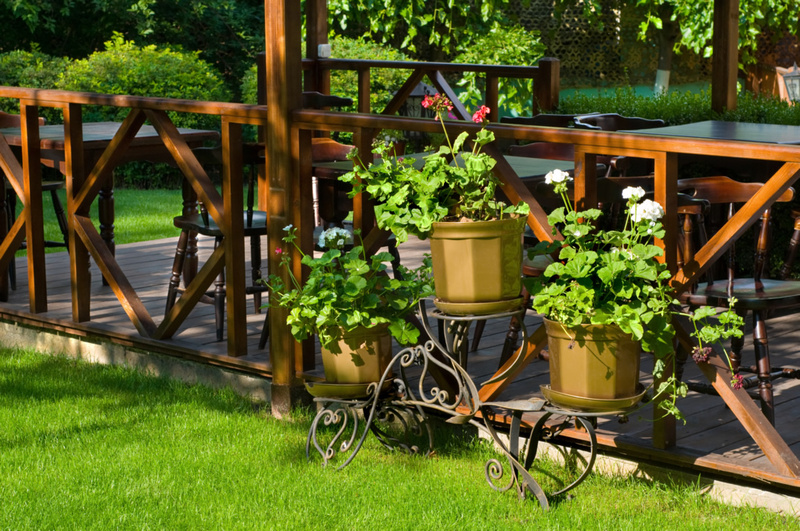 Most owners who choose to decorate their patio in an eclectic style use lots of flowers and plants. As you can expect, plants and flowers bring a certain natural beauty to a patio, which is why they're popular with eclectic. Consider hanging some from the roof of your patio or along the railing.